Free Download from our Soundcloud. HOT DJ MIX ALERT ! Can you Belive its been 25 years of the Ragga Twins running the dance . Not forgetting the 25 year celebration album on our PASSENGER label. Three men, eight albums, five hundred tracks, four labels, numerous aliases, myriad genres: One machine. Brent Newitt, Dave Wallace and Kieron Bailey have played by their own rules and stamped with their style since day one. 20 years deep into their game and the indelible Aquasky legacy is sprayed colourfully, thoughtfully and, at points, antagonistically over all shades and styles of electronic music since they started exploring the new wave of early 90s rave: drum & bass. In their 20th year in the game, the guys are proud to present you with their early work on seminal label Moving Shadow in the form of ‘Shadow Era’ parts 1 & 2. Check our latest single out now. 2 tunes going back to the 135bpm breaksy bassline tip, featuring the vocal talents of our long time collaborators Daddie Freddie and on the flip side lexOne. check the release here on beatport. Nice interesting feature in Kmag about Moving Shadow, showcasing some of the seminal tracks from this awesome label, and nice to have our first release Dezires included in there..
have a look and a listen on Kmags site here. Passenger have collaborated with the super cool clothing label DIRTY SMART on there latest release. Dirty Smarts head honcho has jumped into the studio and come up with a collection of floor burning tunes. Titled “THE BREAK YA NECK EP” and featuring the vocal skillz of Dutch Courage, the debut release from Mr Dirty Smart has some heavy weight names bringing the remix duties, including OLIVER TWIZT, STEREO HEROES, KIETH & SUPABEATS,BLACK NOISE, and GENETIX. The lead track has a video courtesy of awesome video animator Kenny Frankland who shows his skills previously on Black Noise’s Jacking my fresh (blogged out by Kanye West on his site cos he loved it so much!) and the iconic Printer Jam video for Mistabishi’s Hospital records release. An interview with Brent about 18 Years of AQUASKY. We got our good friends Genetix to work some magic on the remix tip for us, and they have gone in HARD. check out the results of both experiments here …we are loving this. Check out our new video,Shot by film maker Jack Croker and featuring the skills of two of the UK’s best Muay Thai fighters, WBC title holder Bernie Mendieta and Harry Baker from Champions world Gym. The track is called “Make it Rain” and features the vocals of Atlanta rapper Sporty O. Watch out for the GENETIX remix also of this tune …its BIG. Bernie Mendieta one of the the fighters in the video used this track as his walkout tune at the Lion fight 9 tournament in Las Vegas. ‘Make it rain’ is part of the album “Bring the Ruckus” about to drop on Passenger. It is now 20 years that the infamous words “Bring The Muthaf**kin Ruckus” was first etched into our consciousness by the RZA on the debut album by The Wu-Tang Clan. An album that snatched the rap crown back from the sun drenched GFunk streets of the West Coast and returned it to the windswept concrete streets of New York’s East Coast. A classic crew, a classic album from a classic era. Now in 2013 Passenger Records head-honchos Aquasky takes that memorable soundbite and flips it into a fresh new compilation. Like the Wu-Tang Clan itself, this album is a collection of individual artists, all established in their own right. Some are young to the breakbeat scene, others are have been rattling bass-cones for many years now. A collection of sounds, inspirations and ideas that all fuses together with one underlying element connecting them… RUCKUS, filthy bassline ruckus!!! With that ethos shared with all the contributors you can be sure this project isn’t for the faint hearted, all contributors brought their A-Game, all trying to out do the other. Out of retirement come the much loved Autobots teaming up with the new dustup producers DeadAudio, fusing the vocal talents of MC Spyda and Roisin Brophy. Aquasky throw forward four tracks, two vocal and two instrumental but all full of demented bass and riffs. HeavyFeet joins forces with Manchester MC, MadRush, for three new schooling beat tonkaz. Original Passenger artist Timmy Schumacher flies in from New Zealand with two firey tunes, one featuring another Passenger regular, MC Spyda, he of Pendulum & Knife Party fame. And returning to drop some vocal gymnastics on Passenger is Atlanta based rapper Sporty-O. 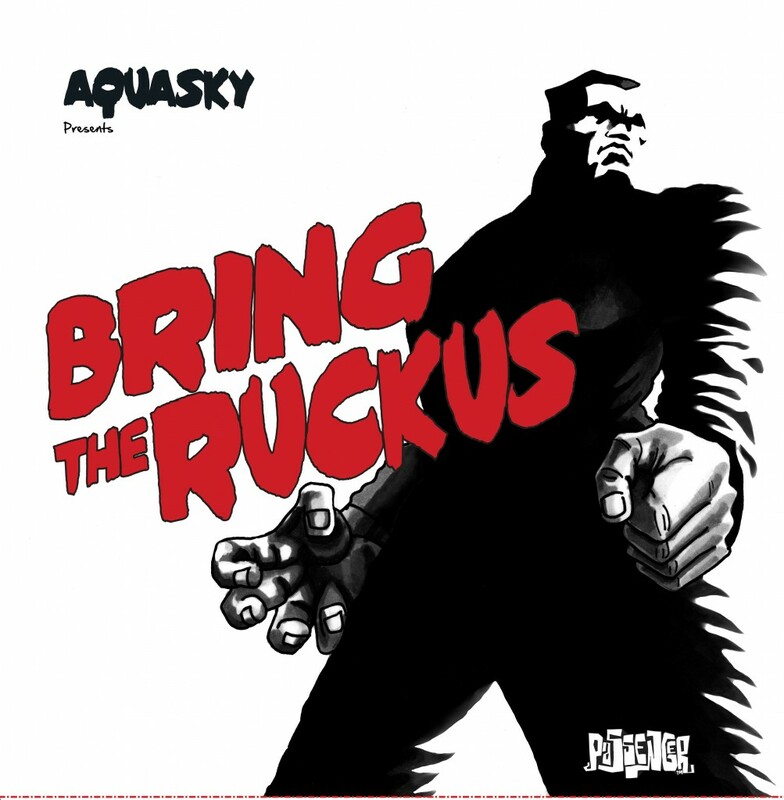 No Aquasky inspired album would ever be complete without the pairing up with Flinty Badman and Deman Rockers from The Ragga Twins alongside their superbad buddies from RTC – CoGee, MTEK and Pedro Slimer. Heading way down south, to the lands of Perth, Australia, we have Black & Blunt and Beatsmack with two straight groovin 140 sleng-tengerz. From the new school of 140 breakbeat producers comes Radiokillaz with their tune ‘War Iz Ugly’ and firmly from the old school, from the era of the original acid house parties of London gone by is the lynchpin of the Rhythm Section; Mr. Rennie Pilgrim. And finally, we have three tracks from the unstoppable 601, taking time out from recording their debut album for Passenger Records titled ‘We Do Bass’. These guys know how to make a killa bassline and unleash Da Madness and here is the evidence! Lastly there are two spanking remixes… one by the man of now in the world of dubstep… the ever angry powerhouse that is Funtcase. Followed up by the Subslayers labels beacon of bass, Toronto Is Broken, for a fierce 140 relick of Rennie Pilgrim. So no pretentiousness here, no hocus pocus… the album title leads the charge. Open your windows and go Bring The Ruckus!! !